"... little changes can have big effects. When small numbers of people start behaving differently, that behavior can ripple outward until a critical mass or 'tipping point' is reached, changing the world." The Obama administration announced on 2011-FEB-23 that it would no longer defend the Defense of Marriage Act (DOMA) in court. They cited an earlier decision in a Massachusetts federal court that found multiple reasons why the federal DOMA legislation is unconstitutional. Some commentators predicted that this step will generate a tipping point that will lead to a more rapid decline in discrimination against sexual minorities in the U.S. The list below may be the start of a rapid decline in discrimination, hatred, homophobia, and transphobia directed against the LGBT community. Only time will tell. But we wonder, along with Rep. Barnie Frank (D-MA) who said: "I worry about what will replace it." Further, the poll showed equal levels of passion: 35% of those polled were found to be strongly against and 36% strongly in favor of SSM. This development may have major political ramifications. 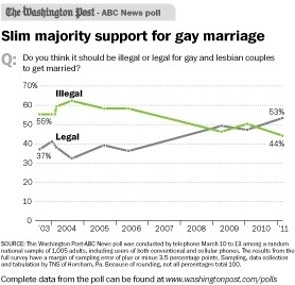 In the past, there were significantly more adults who were strongly opposed to SSM than were strongly in support. This led many politicians to fear granting equal marital and other rights to lesbians, gays, bisexuals, transgender persons and transsexuals (LGBTs). They were concerned that any step towards equal treatment would trigger a backlash by social and religious conservatives. Now, they will probably anticipate equal backlashes no matter what action they take towards equality. Finally, there was a surge in the percentage of men who support SSM; in the past, there was much higher levels of support among women. More details. 2011-MAR-16: Federal DOMA law: Democrats in Congress introduced bills in the House and Senate to repeal the federal DOMA law. This can only be regarded as a purely symbolic gesture because there is zero chance that the bill will be passed in the Republican controlled House. "Exodus’ message is hateful and bigoted. They claim to offer 'freedom from homosexuality through the power of Jesus Christ' and use scare tactics, misinformation, stereotypes and distortions of LGBT life to recruit clients." A petition to remove the app from the Itunes store was signed by over 154,000 individuals. Apple removed the app on 2011-MAR-22. Their spokesperson Tom Neumayr said: "We removed the Exodus International app from the app store because it violates the developer guidelines by being offensive to large groups of people." More details. "While LGBT populations often are combined as a single entity for research and advocacy purposes, each is a distinct population group with its own specific health needs. Furthermore, the experiences of LGBT individuals are not uniform and are shaped by factors of race, ethnicity, socioeconomic status, geographical location, and age, any of which can have an effect on health-related concerns and needs. Researchers still have a great deal to learn and face a number of challenges in understanding the health needs of LGBT populations." Malcolm Gladwell, "The Tipping Point: How Little Things Can Make a Big Difference," Back Bay Books, (2002). Read reviews or order this book safely from Amazon.com online book store.